This past Saturday night, I put my wrestling promoter’s hat on, again, for our second annual pro wrestling charity event, ElkMania 2. Last year’s show was a huge success as we raised $1400. 00 for the Elks National Foundation which funds youth programs, college scholarships, and veteran services. 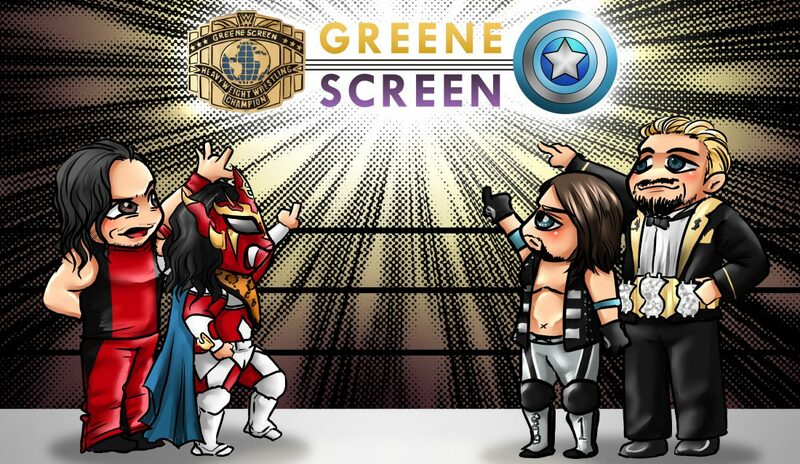 My colleagues and I put together a fantastic show with the goal of exceeding its predecessor in every way and we had a former WWE Superstar to help us out. The double edged sword of booking and promoting an independent wrestling show can pierce the skin at any time. Booking talent, accruing production costs through sponsorship, dealing with diva attitudes, and trying to put on the best possible show contains a lot of moving pieces. Dealing them can be exciting or exhausting depending on circumstances. Some folks still stick their nose up at wrestling, which presents some marketing hurdles. Last year’s show had many detractors going in and their frowns were turned upside down by the final bell. This year, the card was stacked from top to bottom and headlined by one half of the Heartthrobs, Antonio Thomas. Thomas is a professionals professional and a versatile performer who puts on a great show every time he steps into the ring. I first booked him for a show I was running in 2009 and remember being impressed with how he carried himself. He also gave me some great advice which was extremely appreciated. We wrestled each other eleven years ago on a show in Nashua, New Hampshire. The powers that be decided that your truly was to be the victor. Looking back at our career trajectories, the way wrong guy won that evening. I need to give special props to Derek Simonetti and Jack Krueger, who stepped into the main event spot on short notice. I’ve always been a fan of Derek’s ring presence and while he groaned a little about the change in plans, I know deep down inside he relished the opportunity, even if he won’t admit it. It’s funny how things work out sometimes. Derek working on the top of the card was never the plan, but lo and behold two years in a row, he has taken center stage, called his shot, and knocked it out of the park. Jack Krueger is someone whose talents my co-promoter Ryan Andrews has had his eye on for a while. I’ve spent many a car ride after a show with Ryan praising his efforts and insisting that he needs a chance to prove that he can be a featured attraction. Krueger is not a bad performer by any stretch of the imagination, however, I didn’t see what Ryan saw, at least not right away. Over time, I came to realize that Krueger is a multifaceted performer who takes great pride in a character he has carefully crafted. On Saturday he proved that he can hold his own in a main event situation. So, how did we do this year? The answer is…….AMAZING! We topped every mark from the previous year and we raised over $2100. 00 for the Elks National Foundation. We couldn’t have done this without our sponsors, volunteer staff, wrestlers, and the fans who came out to support the show. Thank you to all and I’ll see you next year at ElkMania 3! 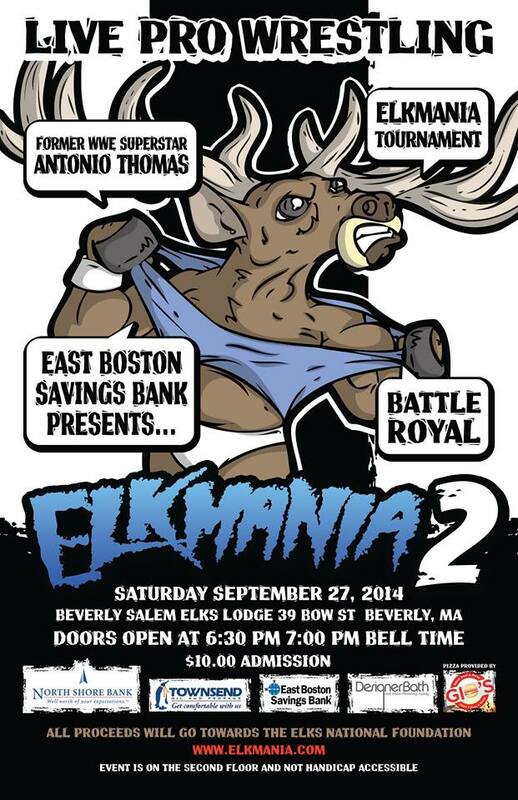 ElkMania returned to Beverly, MA this past Saturday night as East Boston Savings Bank presented ElkMania 2. Thanks to our event sponsors and volunteer staff and fans, we raised over $2100.00 that was donated to the Elks National Foundation which supports youth programs, veteran services and scholarships. “The Goddess of Beauty” Ramona Romano defeated Antonio Thomas by pinfall via a handful of tights to retain the Bay State Championship. Post-Match saw Romano try to blindside Thomas from behind, only for Thomas to gain the upper hand and send The Goddess of Beauty” crashing to the mat with a choke slam. Thomas brought a young boy into the ring and he covered the champion for the 1-2-3 which made the fans go wild. Joey Warner vs. Biohazard ended in a double count out. The two combatants continued to brawl after the bell and ElkMania officials decided to let them continue their affair in the Battle Royal. “The Maniacal” Jack Krueger w/ Dominic Delano and Brendan Behm defeated Derek Simonetti via pinfall to win the 2014 ElkMania Tournament. After the match, Krueger, DeLano and Behm beat down Simonetti until Joey Warner and Jon Wilson made the save. The mayhem involving all six men went over the Elks lodge. When the dust settled and the smoked cleared, Simonetti and Delano found themselves in the ring alone. Simonetti blasted the Delano with the Krueger’s newly won Tournament Trophy, smashing it into oblivion. Following the melee, Simonetti and friends celebrated in the ring with a raucous crowd at the Elks Lodge. East Boston Savings Bank, Salem Plumbing Supply, Townsend Oil and Propane, North Shore Bank, Boston Red Sox, Boston Bruins, Sam & Joe’s Restaurant, Stop & Shop Supermarket, Beverly Athletic Club, 99 Restaurant, Farms Full Service, Gallo Nero Ristorante, Peabody Essex Museum, Silver Moon Comics & Collectibles, Prime Meats & Provisions, THE FARM Bar & Grille, Wenham Country Club, Bowl O Mat, Staples, and Triad Driving Academy in Beverly, MA.